Okay, I promise. This is the end of the elimination series(1), as I’m running out of eliminations, unless we want to explore vomit. Along with excretions like feces and urine, the body also removes waste via the skin in the form of perspiration or sweat. It’s a vital function and most of us don’t think about it unless it’s profuse, smells, or marks our new, overpriced, Anthropologie top. 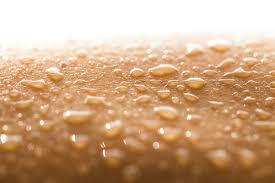 Sweating has two major functions–regulating the body’s temperature and eliminating toxins. It also fuels a bazillion dollar anti-odor industry hell bent on eliminating sweat and odor. Have you checked the deodorant aisles of your local CVS! That’s entirely different road to go down, so don’t get me started. The skin is our largest organ and through its 2.6 million tiny pores it performs an important role in elimination. It removes 30% of the body’s waste products and is sometimes referred to as our “third kidney”. The most numerous pores are in the forehead, the armpits, the palms and the soles of the feet. The sweat is made up of water and saline but also has urea (a breakdown product of proteins the kidneys also discard), and trace metals and minerals. Perspiration is something we cannot control and even when you don’t know it, the body is sweating a little. Sweat is handled by our body’s autonomic nervous system. One half of the autonomic nervous system, the sympathetic side, is known for the flight/flight response and can bring on sweating when we’re spooked or excited, stressed or in pain. Remember the scene in the movie Broadcast News where Albert Brooks gets the flop sweat on air. Here’s the clip. Or what about Ben Stiller in Along Came Polly. Still hilarious! There’s a condition known as hyperhidrosis, or too much sweating, and is a serious medical condition. According to sweathelp.org, over 367 million people or 5% of the global population has it. This excessive sweating is not tied to the body’s normal functions of perspiration. People with hyperhidrosis can sweat four or five times more than normal. As you can imagine, it can not only be embarrassing but disruptive of a person’s life from career choices to relationships to self-confidence. There are many things that can be done, like super-strong antiperspirants, oral medication and even surgery. What about body odor? There are two different types of sweat glands, eccrine and apocrine. Eccrine glands are found in large numbers on soles of the feet, palm, forehead, cheeks and armpits. They produce mainly watery, odorless sweat. The apocrine glands are in the armpits and the genital areas and produce a thicker, viscous and more visible fluid. The apocrine sweat is also odorless, but when it comes into contact with the body’s bacteria the strong “body odor” is produced. The larger volume of sweat from the eccrine glands can “wash away” bacteria and the stink producing apocrine sweat. When the apocrine sweat has an opportunity to dry on the skin and react with the body’s bacteria, odor is produced. Sweat odor can also be caused by some foods and your body’s overall toxicity levels, among other factors. Even some medications, like Tylenol, can encourage excess perspiration and foul smelling bacterial growth as drugs are metabolized by the body, according to the Mayo Clinic. The stink you’re smelling may not even be you. The new breeds of synthetic clothing fabric is harboring bacteria and gets activated with your body heat. Besides regulating temperature, perspiration has a body-cleansing function, It’s healthy to sweat often, especially through movement. When we exert ourselves, we also increase our blood flow which releases toxins. High intensity work-outs, especially in a heated room can bring on a healthy sweat. Most of you are familiar with Bikram yoga, which heats the room to 104 degrees with added humidity. As compared to gyms which often keep their weight rooms cool, yoga classes are often purposely warmed. So, in addition to the vigorous asana practice you’re also being heated from the outside. Sweating can also be encouraged by visiting your favorite sauna or steam room. There you have it. There’s lots more to be said about perspiring, but I’ll let you do the research if I’ve piqued your interest. As always, I enjoy your feedback or just a quick “hello”. This entry was posted in Health-Wellness by cherylthomas. Bookmark the permalink.